It is believed that prehistoric hunters crossed the Bering Strait from Asia, reaching the land of today’s Canada some 40,000-30,000 years ago. Europeans started exploring and claiming these territories 500 years ago. Back then, only First Nations people lived there. Yet, they had at least 53 different languages. Canada was a multicultural land back then, and today it still prides itself on its diversity. Even though people settled in Canada thousands of years ago, it wasn’t until the late nineteenth century that the country began to shape as we know it today. July 1st marks the anniversary when the Canadian Confederation was officially proclaimed by the 1867 Constitution Act. Initially, only four provinces formed Canada: Ontario, Quebec, Nova Scotia, and New Brunswick. The country now consists of thirteen administrative divisions: ten provinces and three territories. Big Canada Day celebrations are planned throughout the whole country on July 1st. This year is even more special because it is the 150th anniversary of the Canadian Confederation. To commemorate it and to celebrate our pride of being a Canadian company, we are releasing pictures of some of the country’s landmarks captured from outer space by our very high resolution satellite Deimos-2. Halifax, the capital of Nova Scotia, combines the exciting history of a strategic port city with the youthful spirit of a modern university and tourist town. The city became internationally known following two enormous tragedies that occurred there. Halifax is where the rescue boats for the Titanic raced back to in 1912, carrying both survivors and the bodies of those less fortunate. Then, in 1917, only 5 years later, an enormous explosion ripped apart the harbour killing thousands, when a cargo ship charged with high explosives collided with a vessel. The blast was the largest man-made explosion prior to the development of nuclear weapons. In spite of those fatal events, Halifax is today a vibrant city, full of shops, museums, galleries, and it is said to have the most pubs and clubs per capita of any Canadian city. Halifax is well known as a tourist destination, and a major economic centre in Atlantic Canada with a large concentration of government services and private sector companies. Moreover, this dynamic seaport city is home to the one of the world’s largest natural harbours and North America’s oldest salt-water ferry. 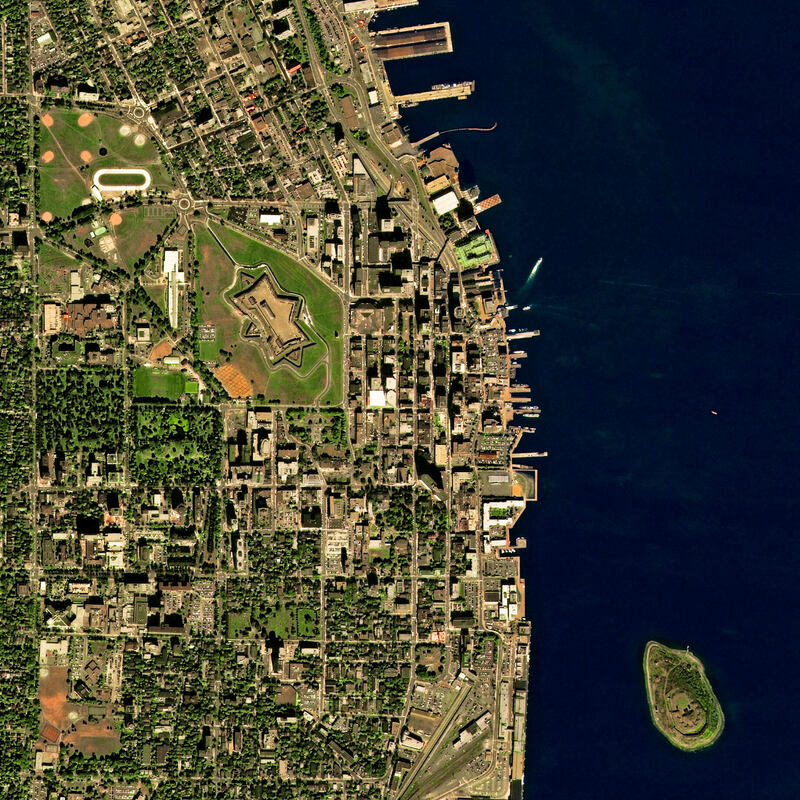 The image, captured by Deimos-2, shows the city’s downtown, its star-shaped fortification Citadel Hill, also known as Fort George, and Halifax Harbour, a large natural harbour on the Atlantic coast. It is strategically located as the first inbound and last outbound port of call in eastern North America with transcontinental rail connections. Established in 1826 as a campsite and construction base for the Rideau Canal, Ottawa was first named Bytown. In 1855, it was incorporated as “Ottawa” and, in 1867, Queen Victoria chose the city as capital of Canada. Being named the capital spurred the city’s growth and development, and the erection of government buildings and homes for the freshly arrived civil servants also started a construction boom. Today, the city’s economy is dominated by two major sectors: the federal government and high technology, which together account for more than 35 percent of the city’s GDP. The combination of these two sectors has resulted in one of the most highly educated populations in Canada. Ottawa contains a UNESCO World Heritage Site: the Rideau Canal, the oldest continuously operated canal system in North America. It was built for military purposes, although it also served commercial ones, as it connects Ottawa and Kingston at 202 kilometres in length. The image is centred on the Canadian parliamentary complex on Parliament Hill, a Gothic revival suite of buildings home of the Parliament of Canada and touristic landmark that attracts around 3 million visitors each year. It also shows Ottawa’s downtown, three of the bridges connecting Ottawa with Gatineau, and the Rideau Canal joining the Ottawa River. Victoria, the capital of British Columbia, is located on the southern tip of Vancouver Island off Canada’s Pacific coast. It’s population expanded rapidly in 1858, with the news of gold found in the Fraser River being spread, in British Columbia’s first significant gold rush. Victoria’s highest revenue industries include tourism, food products and education. However, it also a thriving technology sector that has risen to be its largest revenue-generating private industry. Victoria is known as “The Garden City” for its abundance of parks and flowers throughout the entire year. It features various garden design styles and different seasonal blooms. This, together with the narrow, winding Victoria Harbour and its long extension make Victoria a picturesque city and a popular tourist destination. 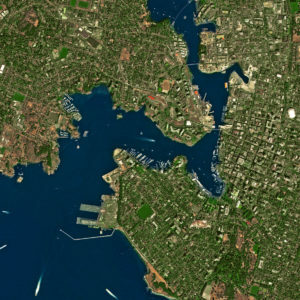 The image, captured by Deimos-2, shows Victoria Harbour, which also contains a seaplane airport, the city’s downtown and Beacon Hill Park, one of the popular parks for which Victoria is labelled “The Garden City”. If a city is judged by its diversity and culture, we are proud to say that Vancouver takes top honours. This bustling west coast seaport in British Columbia, is among Canada’s densest and most ethnically diverse cities. Although Vancouver now counts as Canada’s third-largest metropolitan area, the city is quite young. It is remarkable that Vancouver’s founding date is also July 1, 1867. On the same day that the Canadian Confederation was officially proclaimed, John ‘Gassy Jack’ Deighton, a man known for his gift of gab, erected his tavern in what is now the neighbourhood of Gastown. This was the original settlement that soon attracted other stores and hotels and later renamed Granville before it became Vancouver. Vancouver’s natural beauty is stressed by a backdrop of mountains and its proximity to the sea. It is one of these rare places where one can ski in the mountains and, within an hour, swim in the ocean. Moreover, the city is home to one of the largest film and television production industries in North America, together with L.A., New York and Toronto. Vancouver is known as the “Hollywood North” for being a hot spot for commercials, TV series and feature films. 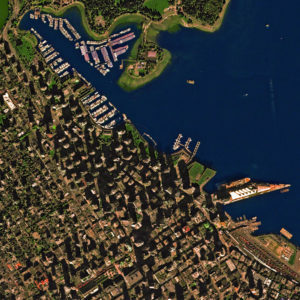 The image shows Vancouver’s downtown, its oldest district Gastown, and the seaside district of Coal Harbour. Right on the water’s edge, next to the iconic sails-shaped Canada Place, is where our headquarters is located! UrtheCast Corp. is a Vancouver-based technology company that serves the rapidly evolving geospatial and geoanalytics markets with a wide range of information- rich products and services. The Company operates Earth Observation (EO) sensors in space, including two satellites, Deimos-1 and Deimos-2, to produce imagery data that is displayed on UrtheCast’s cloud-based web platform and sold to partners and customers. 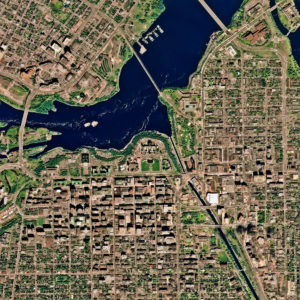 Through its subsidiary Deimos Imaging, UrtheCast processes and distributes imagery data and value-added products on behalf of the PanGeo Alliance, a network of eight satellite operators with a combined 15 medium- and high-resolution EO sensors. UrtheCast is also developing and expects to launch two EO satellite constellations: the world’s first fully-integrated constellation of sixteen multispectral optical and SAR satellites, called OptiSAR™, and an eight-satellite constellation designed to capture high-quality, medium- resolution optical imagery of the Earth’s entire landmass (excluding Antarctica) every day, called UrtheDaily™. Together, the Company believes these constellations will revolutionize monitoring of our planet with medium- and high-resolution, high-coverage and high-revisit imagery in all weather conditions. Common shares of UrtheCast trade on the Toronto Stock Exchange as ticker “UR”. This release contains certain information which, as presented, constitutes “forward-looking information” within the meaning of applicable Canadian securities laws. Forward-looking information involves statements that relate to future events and often addresses expected future business and financial performance, containing words such as “anticipate”, “believe”, “plan”, and “expect”, statements that an action or event “may”, “might”, “could” or “will” be taken or occur, or other similar expressions and includes, but is not limited to: UrtheCast’s expectations with respect its current sensors and proposed OptiSAR™ and UrtheDailyTM constellations; its plans for and timing of expansion of its product offering and value-added services; and its future growth and operations plans. Such statements reflect UrtheCast’s current views with respect to future events. Such statements are necessarily based upon a number of estimates and assumptions that, while considered reasonable by UrtheCast, are inherently subject to significant uncertainties and contingencies. Many factors could cause UrtheCast’s actual results, performance or achievements to be materially different from any future results, performance, or achievements that may be expressed or implied by such forward-looking statements, including, among others: any delays or failures in the design, development, construction, launch and operational commissioning of the proposed OptiSAR™ or UrtheDailyTM constellations; the Company being unable to adequately finance the development, building, launch and commissioning of the UrtheDaily Constellation or to convert the remaining MOUs and other customer discussions in respect of the OptiSAR™ constellation into binding, definitive agreements;; the decline of key relationships in, or termination of, the PanGeo Alliance of EO satellite operators; loss of key EO imagery sales contracts or customers; failures aboard the ISS or the Deimos-1 or Deimos-2 satellites; failure to obtain, or loss of, regulatory approvals, as well as those factors and assumptions discussed in UrtheCast’s annual information form dated March 28, 2017, (the “AIF”), which is available under UrtheCast’s SEDAR profile at www.sedar.com. Forward-looking information is developed based on assumptions about such risks, uncertainties and other factors set out herein, in the AIF, and as disclosed from time to time on UrtheCast’s SEDAR profile. UrtheCast undertakes no obligation to update forward-looking statements except as required by Canadian securities laws. Readers are cautioned against attributing undue certainty to forward-looking statements.